I listen to the radio a lot. Since I started working from home last March, Radio 6 has been a constant companion throughout my day, from my first cup of Yorkshire Tea (always Yorkshire Tea, don’t ever try to tell me otherwise) to the long, drawn out years between 2pm and 6pm, it’s there in the background cheering me on. Sometimes I drown it out with my headphones when I really need to concentrate – a habit I’ve failed to shake from my office worker days – but usually I’m grateful of the sense of company, and the insights into music, art, culture and points of view I may never have considered otherwise. In my happily introverted world, it offers a misty window out into the place that exists beyond my kitchen table. Recently, the station has been running a campaign to rediscover and champion local independent music venues, and the more interviews with passionate but skint promoters and owners they broadcast, the stronger I’ve noticed the overlap between their struggles and the struggles of our favourite pubs, taprooms and breweries. There’s an emotional connection there, for sure – the same revolutionary attitude towards resisting developers and buyouts smoulders under a heavy smog of frustration, the same anger and resigned futility wafts through their bravado into their everyday conversations. This connection is especially present in their energy and passion – for both groups there’s a real belief that the work they are doing is vital to their customers and their wider community. Hearing from the people who run local music venues offered an insight into how difficult it has become to create and continue these essential artistic spaces in towns across the country is mirrored in how bar and brewery owners feel. Both struggle against rising tariffs and greedy leaseholders, both find themselves at the mercy of late-payers (pay your suppliers!) and the spectral grasp of developers. Developers come up time and time again in these conversations. Forever circling the shaded areas of city maps, waiting for local arts movements and community spirit to set in and bring a bit of prosperity to the area. Then they swoop. Built apartments and sold them to those who like complaining. For the important emerging acts. Inspiring the next generation…” – Lyrics from an extended version of Leopard Print Onesie by The Humdrum Express performed live on a special show from Worcester during Independent Venue Week in January 2019. The Humdrum Express has also written a tune about craft beer bores but I’ll let you find that one yourselves. I don’t have any better pics of The Trades Club, sorry. While I’m discussing the relationship between indie beer and indie music venues, I’m going to have to use the B word. 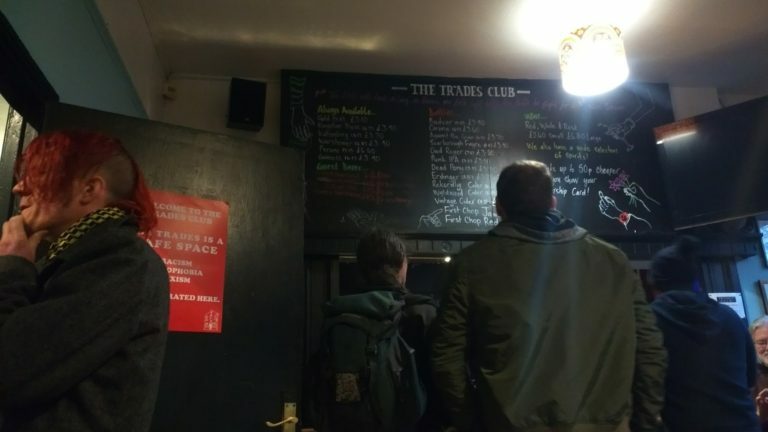 The Brudenell Social Club in Leeds has a famously incredible procession of bands touring through their doors, but they’ve also become notable for their rotating list of excellent beer. Together, it seems above and beyond the call of duty. That’s why people don’t just visit the Brude, they enter into a lifelong relationship with it. Even my local venue, The Grand in Clitheroe, has upped its beer game in some capacity, offering locally-brewed cask ales from Bowland Brewery. Yes, they might be in bottles, and yes the last time I was there I got an Estrella because of my whole holiday beers thing, but I think it’s telling. It’s made me hope that there’s ways our closely-connected industries could work more closely together to support each other, providing community spaces that nurture local talent and foster subversive thinking and exciting subcultures. Plenty of breweries use music as inspiration for their artwork and their brews. Plenty of tap rooms have band nights. Plenty of independent music venues sell good beer. Maybe there are ways to take this mutual appreciation one step further? Love is invested in music and beer. It makes sense that artists like Art By Volume, who are creating work that celebrates both cultures together, has instantly resonated with hundreds of people. We make a very close Venn, us beer and music people. I hope we can get even closer.